Home / Competitions / entertainment / Who's line is it anyway winner! Who's line is it anyway winner! 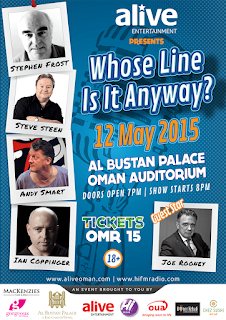 Tonight see's the latest Who's line is it anyway show which is being held at the Al Bustan auditorium at 8pm. Tickets cost RO 15 a pop and are available at OUA in MQ and Mackenzies Cafe too. However, I have a pair of tickets to give away and the winner's email has been contacted with details on how to claim their tickets.